Gulp is a tool that automates many of the tasks associated with development. It brings consistency to development process, thus eliminating development errors. These front-end tools made developer’s life easy. But they also bring with them lot of manual work. Whenever there is repetitive manual work, it leads of boredom and error. Programmers hate manual work. This is where a tool like Gulp helps. Gulp is a tool that automates many of the tasks associated with development - compiling, reloading server, testing, and so on. Such a build tool brings consistency to development process, thus eliminating development errors. Let us now get started with gulp. Getting started with Gulp is a 3-step process. When we execute gulp, the default task is executed. So let us consider, this gulpfile.js. 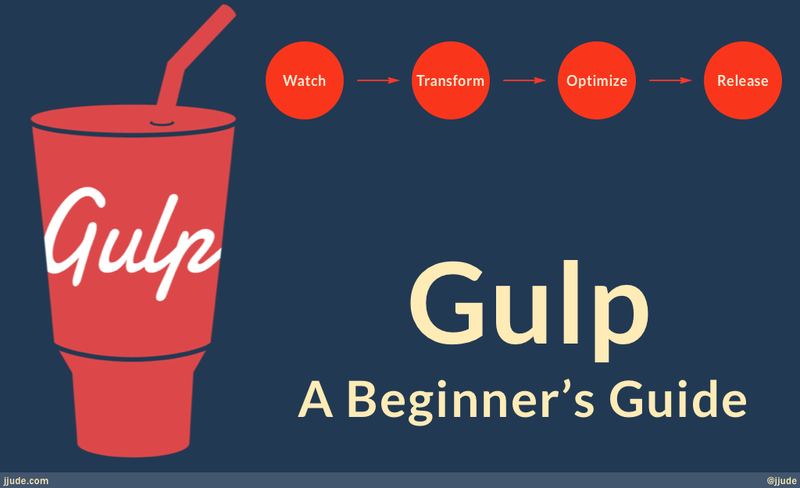 Before we dive deep, let us understand how gulp works. Gulp is based on the concept of tasks and streams. Each task takes an input, does whatever it is supposed to do, and then passes the output to next task. Because of tasks and streams, we can break down our workflow into smaller tasks, and pipe them together for the needed workflow. We can mix and match these tasks the way we want. This makes gulp highly flexible. The Gulp API is small. There are only 4 functions. Let us look at these functions. It selects the files to use. It uses .pipe to chain its output to other tasks. You can use globe or array of globes to select files. It points to the output folder for files. In the previous example, the minified js file will be written to a folder named build. It can also pipe its output to subsequent tasks. For example, we can select all .js files, minify them, and write to a build folder. It defines the task to execute. You can also specify tasks that need to be completed prior to executing the current one. If you have other tasks to complete prior to compiling, you can specify them too. Keep in mind that gulp doesn’t execute these tasks in sequence; they are executed in parallel. As the name suggests, it watches files and invokes a task when a file changes. As the title suggests, this post is only a beginner’s guide. Its purpose is to introduce Gulp. Please read my Comprehensive guide to using Gulp with hapijs & Typescript for a practical example of using Gulp to automate workflow for backend node.js development using hapi.js and Typescript. You can also browse through gulp recipes to pick up the ones that suits your need. Also browse through gulp plugins to identify plugins that you need. Finally, don’t forget to subscribe using the below form to learn full-stack programming.